For a year now I’ve been oohing and aahing over all your fantastic parties. Now it’s time to show you one of mine. 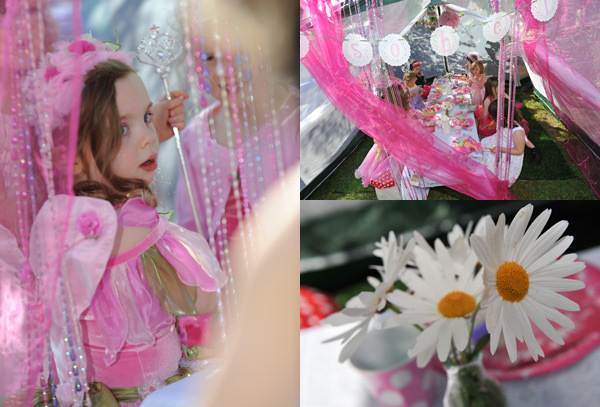 Come inside my daughter Isobel’s most amazing fairy party. 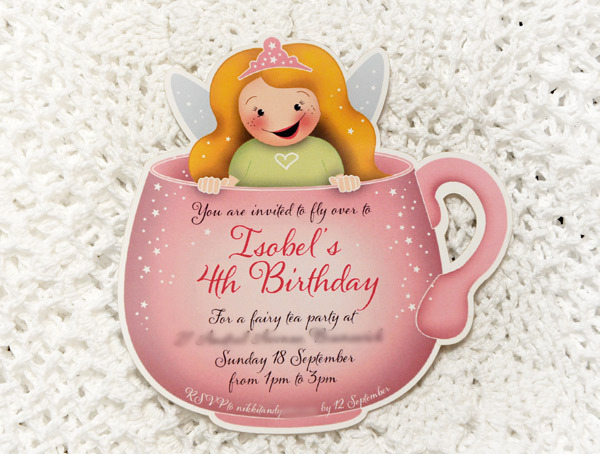 It all started with a downright delightful fairy invitation that was kindly custom-designed to match our party colours by superlative party boutique Invite Me. This was Isobel’s first solo birthday party with her own friends– she shared the last two birthdays with her big brother – so I wanted to make it extra special. 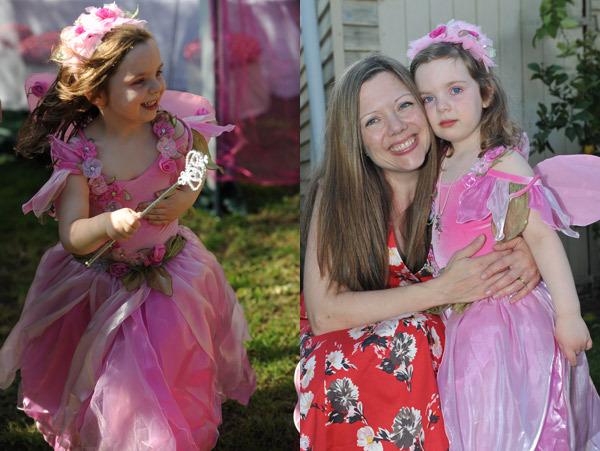 My goal was to make a party so magical, so full of birthday joie de vivre, that the memory of the day would still bring a smile to her face and a warm glow to her heart, even decades from now. Tragic, aren’t I? 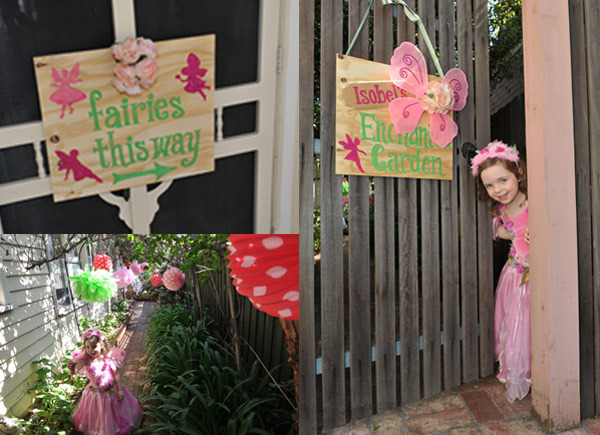 I wanted the fairies to feel they were entering a magical garden so I made some glittery signs to direct them to the back garden and hung lots and lots of tissue paper pompoms that I made using these instructions found online, and Robert Gordon paper lanterns from the trees along the side path leading to the party. 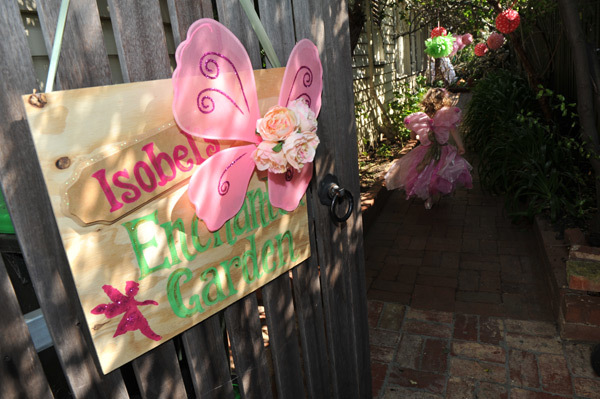 Isobel didn’t want a “real” fairy to come to her party (coincidentally saving me quite a few hundred dollars!) but happily agreed to let her big cousin don some wings on the day. 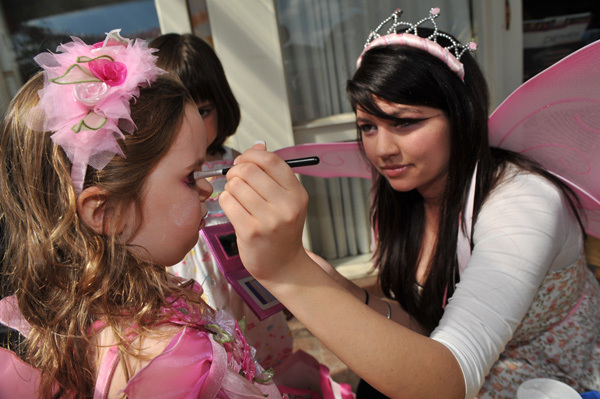 My niece brushed fairy dust on each girl’s arms and cheeks as they arrived and won them over completely with a dab of sparkly eyeshadow and lip gloss! 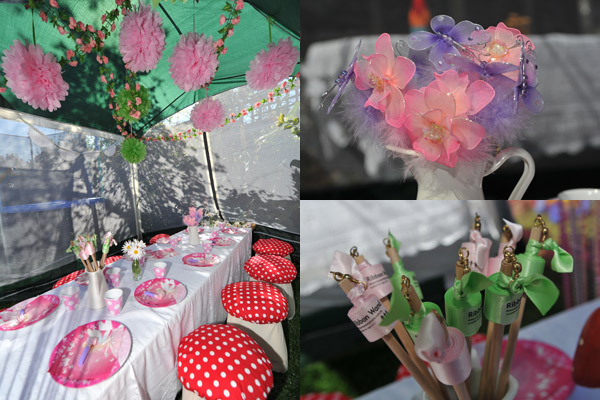 I created a fairy bower for Isobel and her nine little guests in the back garden inside a picnic shade tent that I decked out with artificial rose garlands and more mum-made pompoms in the party colours of pink and green (with a splash of toadstool red!). The girls all sat on “toadstools” sewn by my very talented – and very patient – mother-in-law. I used pretty pink crystal door beads found at Ishka’s and pink sheer curtains (a bargain $10 at Kmart) to frame the entrance to the fairy bower. I cut Isobel’s name from pretty scrapbooking paper and stuck it to small paper doilies threaded onto sage green ribbon to make a name banner. I made another longer bunting using larger paper doilies folded in half that I hot-glued onto a thicker green ribbon – you can just see it in the larger photo above – the effect was stunning. 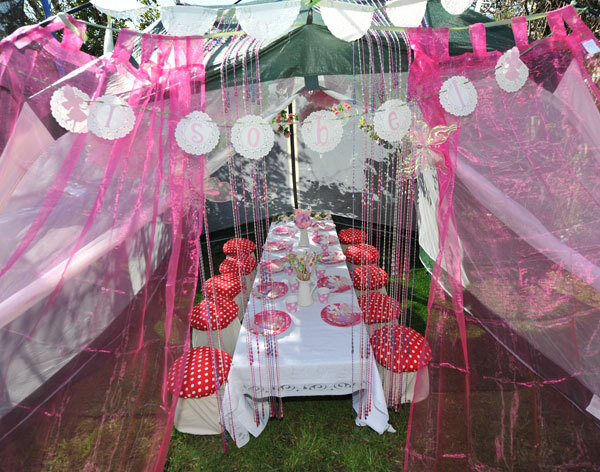 I also had a personalised bunting made at Etsy store Tiny Cherubs from a selection of beautiful floral and broderie anglaise fabrics, but my husband neglected to photograph it for me, except from a distance in a photo way down below! But trust me, it was gorgeous! 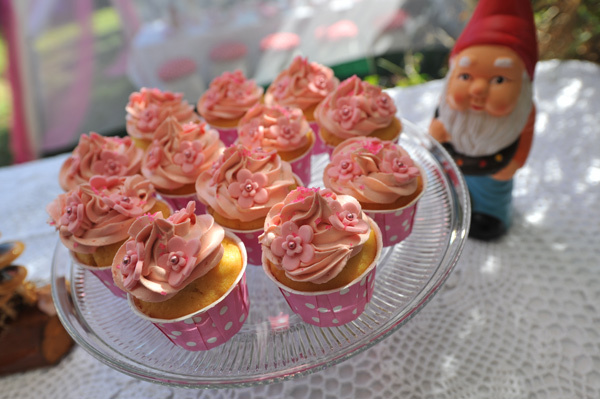 I used lace tablecloths over plain on the tables for a vintage touch, then used some of the take-home party favours – the ribbon wands and fancy pink and purple pens – as table decorations, along with ceramic toadstools discovered at my local Reject Shop for $4 a piece, a cutesy gnome from my local Woolworths for a bargain $1.26, fresh daisies from a neighbour’s garden and a wooden folk art mushroom borrowed from my mum. The fairy feast included homemade sausage rolls and chicken nuggets for savoury options. 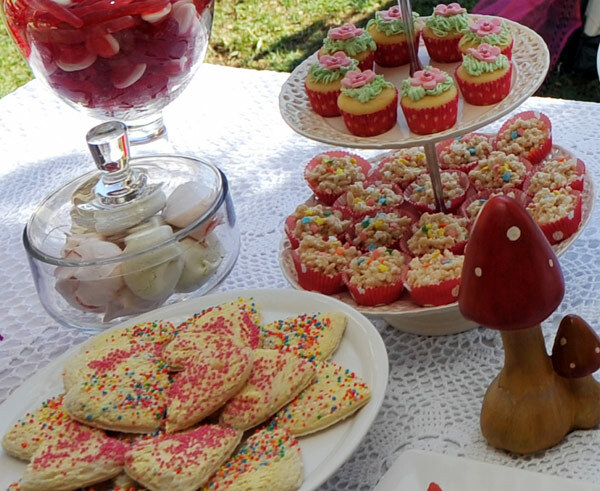 For sweet things, I baked three kinds of cupcakes, fairy wand biscuits, white chocolate crackles and made marshmallow mushrooms and heart-shaped fairy bread. (I forgot to put those last two on the table until after this photo was taken!). 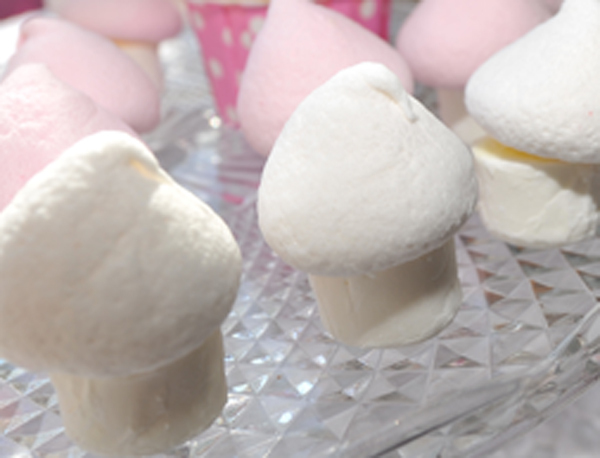 My mother-in-law also made her famous old-fashioned meringues and there were lots of berry-shaped lollies – all housed in stunning lolly jars from party boutique Invite Me – to give the sweets table a pop of red. 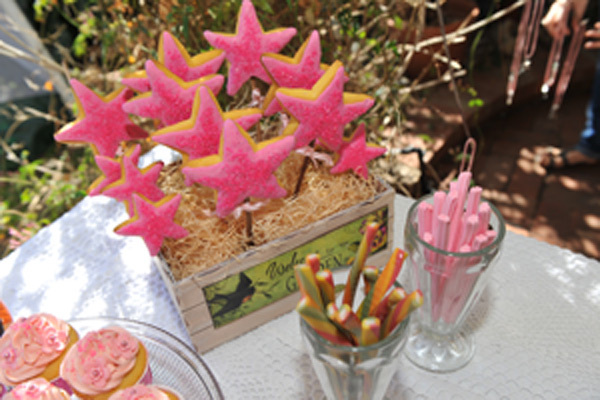 I balanced all the sugar with fairy fruit wands, topped with watermelon cut into star shapes. 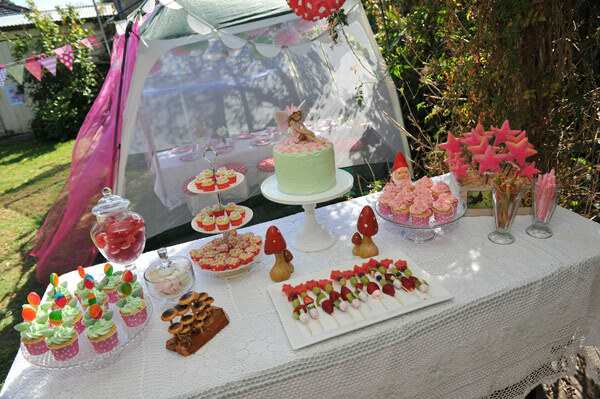 Of course, the star of the sweets table was the fairy birthday cake, set on the milk glass pedestal cake stand I’d long coveted from Donna Hay. 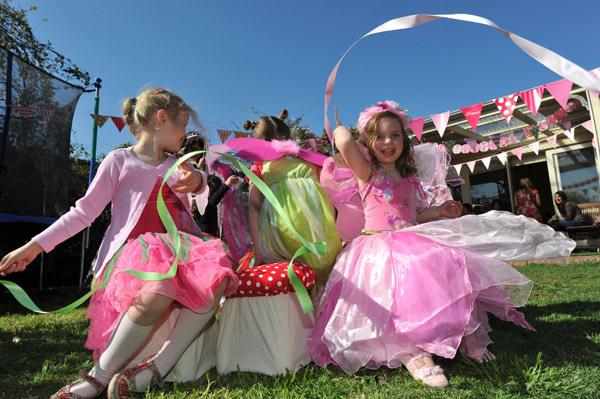 My daughter gasped when she saw it decorated on the morning of her party– truly! 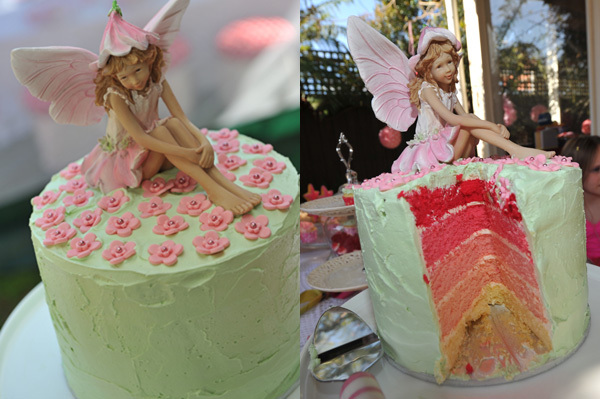 I wanted to bake a pink version of a rainbow cake – as seen on one of our previous parties – and was very nervous when cutting the first slice! But it worked a charm! 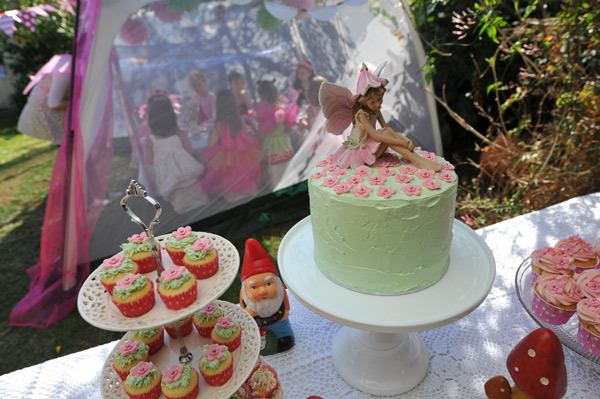 I kept the outside of the cake deliberately simple, with a pale green buttercream icing and pink fondant flowers I made myself – all topped off with that beautiful fairy I found online. 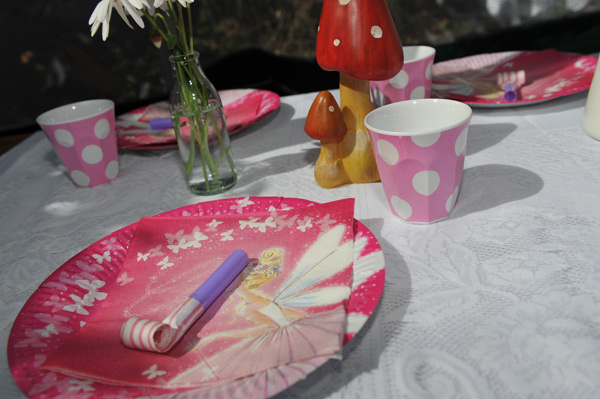 I skimped on fairy plates and napkins found at discount chain Big W ($2.97 per pack for twelve – bargain!) but lashed out on melamine polkadot cups for the girls to drink their Pixie Punch from, with matching polkadot paper straws sourced from Etsy store Hey YoYo. I didn’t want to use my mini glass bottles outside for fear of broken glass and figured heavier melamine cups would be less likely than paper ones to be knocked over by the wind or any overexcited fairies. 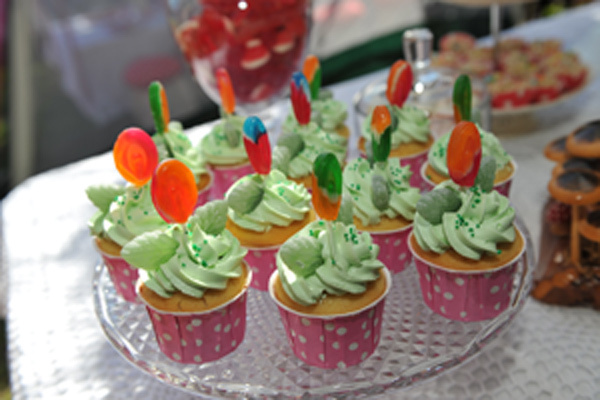 The spotted cupcake wrappers – big and small – also came from Hey YoYo. 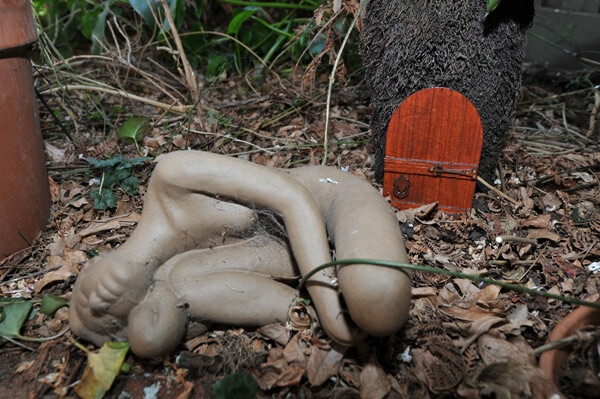 I dotted these fairy doors around the back garden and used them for a fairy treasure hunt. Each guest was given a party bag sewn from vintage-style fairy fabric and personalised with calico name tags – it’s amazing what you can do with a home computer and a bit of iron-on paper! 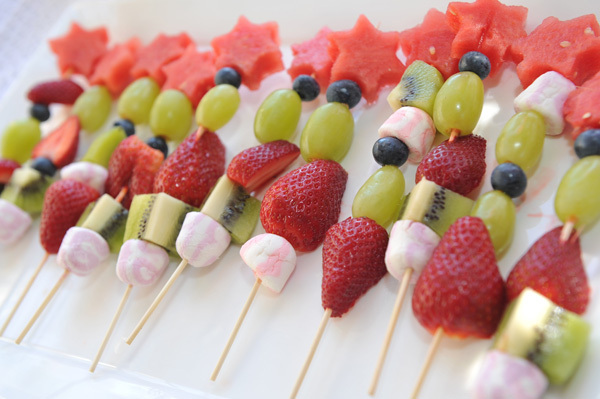 The girls really loved this part of the party! 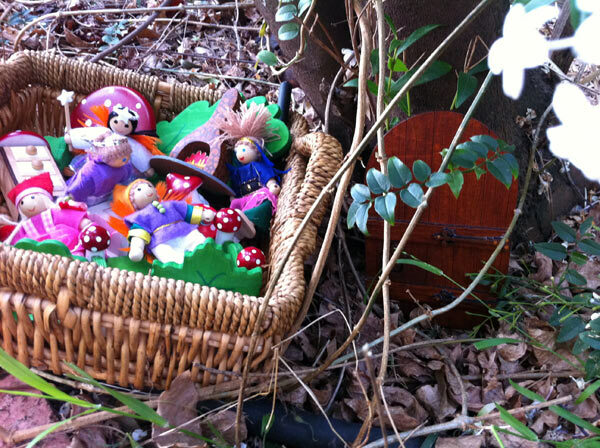 The “fairies” also left a special note and a present for Isobel – some wooden fairy furniture and an entire fairy family for her dollhouse – as a memento of her day. She was so excited, her voice could only squeak! Then came some fairy dancing, with ribbon wands from Invite Me, as well as quite possibly the prettiest pass the parcel ever! 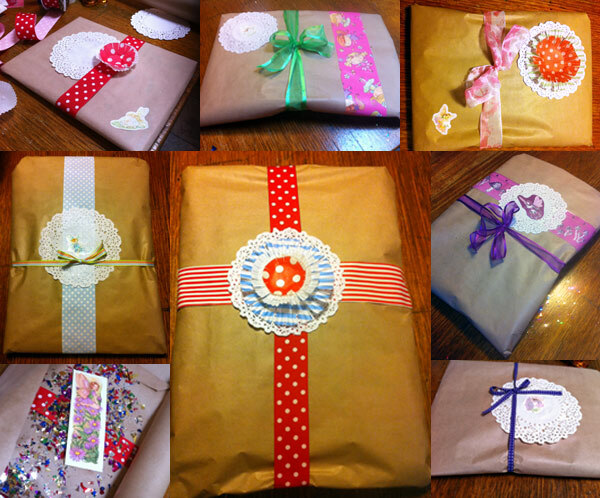 I was inspired by this post I wrote last year about Bob Boutique’s party parcels and decided to make my own. Here are some of my parcel layers. 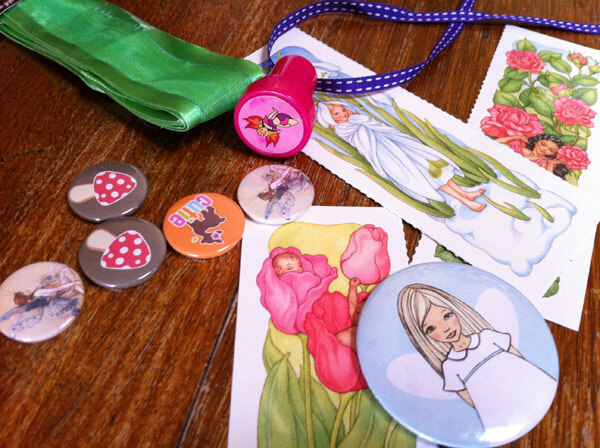 I wanted each girl to feel special when she got her turn so I used pretty ribbons and trims before filling each layer with fairy glitter and a little gift, including these fairy badges, fairy bookmarks, stickers, mirrors and other delights. Other games included Fairy Fairy Goblin (a fairy version of classic game Duck Duck Goose), musical mushrooms using those delightful toadstools that started out life as Ikea stools and pin-the-wand on the fairy. I made this myself too, enlarging a picture from a colouring book we had at home and cutting ten little wands from glittery cardboard, after a search for a pre-made version failed dismally.